We’ve got more Voki Classroom updates rolling in and we think you are going to like these! As of this week, improvements have been made for reviewing Vokis as well as the multi-delete function for students. We’ve also implemented additional student privacy settings to Voki Classroom. To improve your organization in Voki Classroom, we have introduced a visual that indicates that a Voki is Ready to Review. After you click the Classes Tab, you will see a list of your Classes and Assignments with the magnifying glass review icon. If there are new Vokis to review in a Class or Assignment, a red star will appear on the magnifying glass as a notification. By clicking on the notification icon, you will be taken to the Vokis that need to be reviewed. It’s now possible to delete more than one student at a time with the new multi-delete function. Select the students you would like to delete then click on the delete button at the top of the column. Click the check box at the top of the column to select all students. You may deselect students by clicking on the check box. Ensuring your students’ information and Vokis are private is now easier to manage with our streamlined Assignment Configuration tool. When it comes time to set up an Assignment Page, the module that pops up allows you to set your Assignment Page Security to public or private and include a password for access. You also have the option to show your students’ names or their initials only. It’s all up to you! 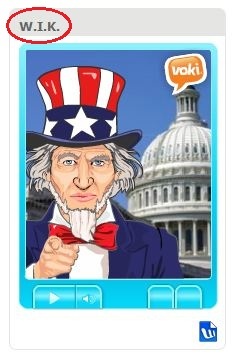 We hope you are enjoying Voki Classroom and always look forward to hearing your feedback! Your opinions matter. If you think of something we could do to make your experience better, drop us a line at feedback@voki.com.